Chinese New Year is just around the corner. It’s hard to miss it as all shopping malls and supermarkets in Singapore have rolled out their CNY goodies from clothes and decorations, to CNY snacks, cookies, cakes and so much more. And let’s not forget the CNY music! What’s a celebration without music and food, eh? Many households will have at least one prawn dish during their reunion dinner and meals during the festive season. Prawns are called ‘Ha’ in Cantonese and it symbolizes laughter, happiness and liveliness. 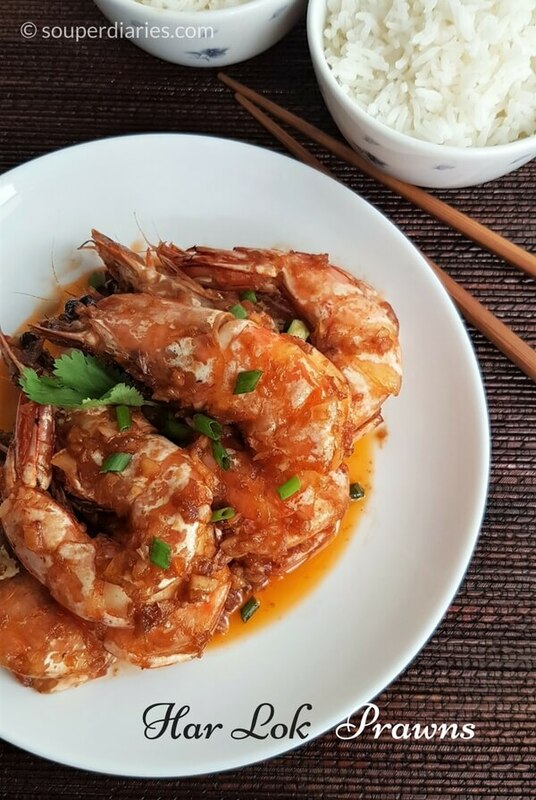 You won’t go wrong with featuring a prawn dish during CNY. Besides, they are really pretty when cooked; turning a bright hue of orange. Or is it red? Remember #thedress? I saw it as white and gold. It was amazing how much controversy the color of the dress caused. 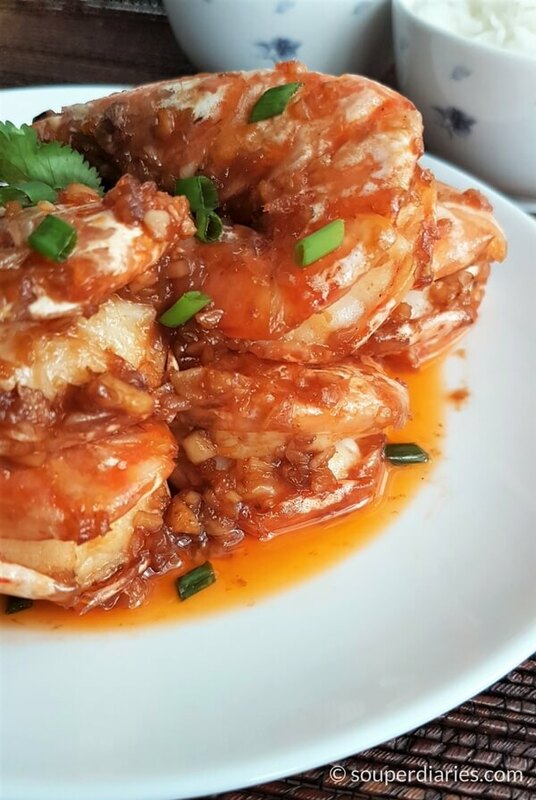 Har Lok is a classic Cantonese dish of fried prawns coated with a sweet and savory sauce. Most people have their own version of this sauce when they make it at home. I came across recipes using black beans, xo sauce, fermented salted beans, etc so as you can tell, the sauce ingredients is flexible. I used Angka prawns (Indian White Prawns) for this Har Lok dish but any type of large prawns can be used. They are very meaty and more expensive compared to some of the other local prawns. I bought them for S$40 per kilo. If my wallet could feel pain, I think it would cry. Lol! Pan fry or deep fry the prawns before they’re coated with the sauce. Whichever way, Har Lok is finger lickin’ good and delicious. There’s a combination of sweet and savory in the sauce and if you like spicy food, just add chilli sauce or spicy fermented bean paste into the sauce mixture. Update (9/1/17): I deep fried the prawns before coating them with the sauce. The results were absolutely delicious! If you don’t relish the thought of deep frying, you can also pan fry the prawns. 1. Pat dry the prawns as much as possible to prevent oil splatters. 2. Have all ingredients prepared in advance as the cooking process is very quick. 3. The oil must be very hot for best results. Test the temperature of the oil by dropping in a small strip of ginger. If the oil bubbles around the ginger, the oil is now hot enough to fry. Alternatively, use a wooden chopstick to test. Same as before. The oil should bubble around the chopstick if it is ready for frying. 4. Devein the prawns so that the sauce can coat more of the prawns. The prawns will also be cleaner this way. 5. Typically, prawn shells are kept on for a Har Lok dish, but I’ve cooked shelled prawns before using this recipe (minus the deep frying). I actually prefer the shelled prawns version because they’re easier to eat and less messy. Oops, did I just say that out loud? Cantonese style fried prawns coated in a sweet, savory and addictive sauce. Prepare prawns by snipping off the 'horn', legs and feelers. Devein, rinse and pat dry with paper towels. Gently rub the salt over the prawns and set aside. Prepare and mix sauce ingredients in a bowl. Set aside. Heat up oil in a wok. Once the oil is very hot, put in one prawn at a time with a long tong or chopsticks. Do not crowd the wok. Fry the prawns in 2 or 3 batches if necessary. Cook on one side and turn and cook the other side till they are about 80% cooked. Remove prawns with a Chinese sieve and drain them on kitchen papers. Remove all but 2 - 3 tbsp of oil in wok. When the wok is hot, stir-fry garlic and ginger till fragrant and the mixture sticky. Pour in the sauce and let it reduce slightly. Return the prawns to the wok. Toss and mix well till the prawns are coated with the sauce and fully cooked. Garnish with chopped spring onions and serve immediately with plain white rice. 1. For some heat, add seeded and chopped red chili when stir frying the ginger and garlic. Alternatively, add a little chili sauce together with the rest of the sauce ingredients. 2. Pat the prawns as dry as possible before gently tipping them into the wok to avoid oil splatters. Funny start! I am a vegetarian and I am looking forward to some vegetarian Asian recipes you post. I will keep bothering you for more veggie stuff. Looks absolutely delicious. I love sea food. I love food! It’s one of the greatest things ever. Thank you for providing the recipe I should try this some time. I love food and seafood too! Prawn, fish, crabs, etc are my favourite. I think the only seafood I don’t really enjoy would probably be live oysters. Nice, that’s good to know! I can’t wait! Hello here, thanks for introducing so exotic dish. At first , I did not know what it is prawns. I am from Europe, more to East, we do not have these things here. Your dish looks tempting. I searched for prawns and found that it is the same as shrimp, just a different name. These shrimps can be different as species, but overall it is the same crustacean. I wonder if you marinate these prawns before cooking? If you do, how long it takes? I heard that people put shrimps or prawns in a hot smoking oil. It is healthy? Anyway, your recipe looks delicious and worth to try. Although prawns and shrimps are both crustacean, they are not exactly the same. However, they’re both delicious whichever way you cook them. I sprinkled salt on the prawns and set it aside for about 10 minutes. Try not to cook in oils that is heated past their smoking point as it will destroy the oil’s beneficial compounds and generate free radicals. Just get it hot enough to cook with. I am one of the lucky ones, I have tried these, and will try them again as I find them easily (on holiday in Malaysia!) very very delicious. Thank you for the instructions on how to make them! I had no idea ketchup in the sauce. The little joke at the start I thought was brilliant.